Outpouring of more and better Sarawak election videos! See here! Wish they were produced earlier for mass distribution to the vast interior of Sarawak! Why the passion come so late??? Limbang: PKR ceramahs disrupted by police as everywhere else-REASON HERE! given was the ceramah without permit. 3.Pejabat SPR di Limbang tidak beroperasi pada hari sabtu ( 9.4.2011). Why Taib quietly paid up his Rm600.00/door promise last month? The infamous `Rm600.00/door' promise was cashed ahead of state elections! Who say politicians don't keep their promise? The news eluded all media: we found out from the residents of Sg Aup that the Rm600.00/door promise made by the Sarawak’s CM taib Mahmud had been paid out in cash via Wong Soon Koh last week! Why the hush around it? My informer suspect the pay out in cash is to evade financial accountability! Or this is the first sign or an early desperation>So what do you think? 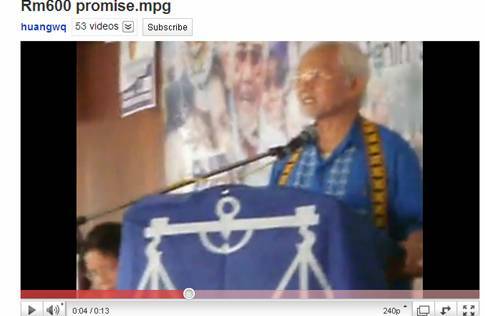 The original video link where taib promised the Rm600.00 is here. Another activist Wong Chin Huat stopped from entering Sarawak! Who could be next? Following the barring of Steven Ng from entering Sarawak another activist Wong Chin Huat was victimised similarly yesterday. look like there is a growing tendency to keep out critics of the regime-which is regrettable! See video statement here.